Nestled amongst the upper reaches of the historic Kaipara Harbour, Matakohe offers "Real New Zealand Heritage" at its best. 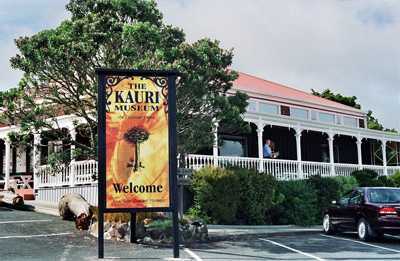 The Kauri Museum is New Zealand's best kept secret that has an element of surprise, located just 90 minutes north of Auckland. Set in the rural background of Matakohe, The Kauri Museum tells the stories of the pioneer settlers through the theme of the second largest tree in the world, the Kauri. The Kauri Tree is famous for its beautiful timber and fascinating gum. En route to the giant Kauri Trees in the Waipoua Forest, The Kauri Museum is a 'must-see' for anyone travelling north. With over 4000sq metres of undercover exhibits, this internationally acclaimed Museum receives 85,000 visitors annually and is the largest undercover attraction in Northland. Highlights include: Interactive hands-on displays; the largest collection of Kauri Gum in the world; Real Steam Sawmill with moving saws, flat belts, countershafts, pulleys and steam engines; huge Kauri logs and real equipment for the transporting and milling of Kauri Timber, and collecting Kauri Gum; and a magnificent collection of antique Kauri furniture. The Kauri Museum is a true masterpiece of New Zealand heritage that will take people on an unexpected journey back in time. At Matakohe, just off SH 12 on the Twin Coast Discovery Highway. Open daily 9am - 5pm (Closed Christmas Day). Cafes/Accommodation nearby. Matakohe was the home of the first NZ-born Prime Minister, Gordon Coates, Matakohe is steeped in history supported by an intensely proud community who will make sure your visit is a truly memorable one. Visitors to Matakohe have the choice of two cafe's. The Gumdiggers Cafe is opposite the museum and 40 yards past the Museum on the same side of the road as the museum is Matakohe House Cafe and B&B Hotel which offer first class accommodation and even has a helipad for guests arriving in helicopters. The Matakohe Top 10 Holiday Park is located at the end of Church Road. The holiday park has amotel unit and self-contained units, cabins, powered sites and tent sites providing quality four-star modern amenities.